Something that struck me time and again, talking to people during the Understanding Walking and Cycling project, was the interconnections between cycling and time. I’ll begin with two observations about how the availability (including lack) of time influences people’s cycling. First, people who typically feel busy sometimes cycle as a way of reclaiming time for themselves; so for example, I met a middle-aged chap in Leicester who spent far more of his time than he’d like driving all over the country by car, but who relaxed once he got home by taking to his bike for a leisurely evening ride, to unwind from the stresses of the day. 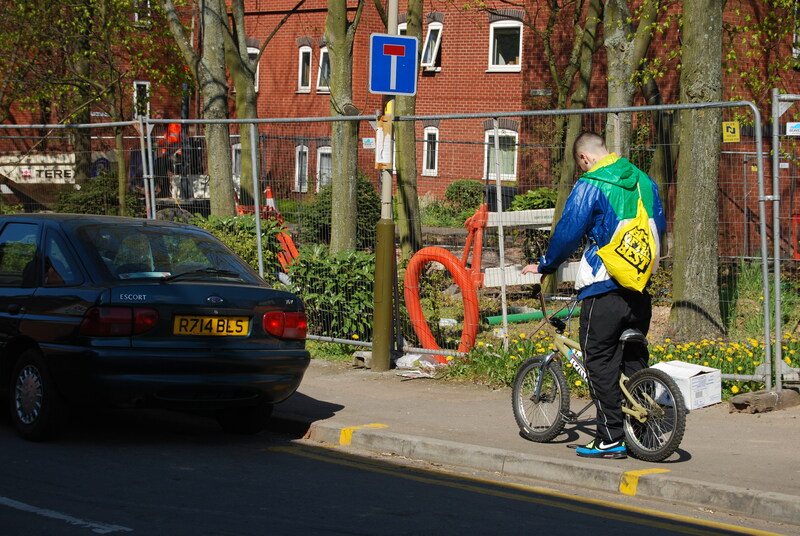 Many people described cycling in such ways – as about quality ‘off-time’; in fact, based on our fieldwork I’d argue that this ‘leisurely cycling’ is the dominant experience of cycling in Britain today. In other words, if you’re ‘time poor’ cycling represents quality down-time, in which to relax and be restored. Then second, people who have more leisurely lifestyles find it easier to integrate cycling as part of their ordinary, everyday lives; so for example, an older semi-retired couple in Worcester cycled for many of their local journeys. They felt able to do so because they never felt in a rush, and could schedule their lives as they liked, rather than having to fit into the demands of others. In other words, if you’re ‘time rich’ cycling can work as a way of organising and connecting different aspects of your everyday life. There’s a contradiction here, between how cycling works for most people today, and how transport policy would like cycling to work. On the one hand, our research suggests cycling might be encouraged by making life in general more leisurely and relaxed. This would also probably promote sustainability, by making life slower and more locally-rooted (and, I’d argue, more enjoyable and convivial). Yet on the other hand, cycling’s increasingly promoted through attempts to speed it up. This trend is clearest in initiatives such as Copenhagen’s ‘green wave’, whereby traffic signals on the popular arterial cycling route of Nørrebrogade are synchronised to enable continuous movement for people riding at 20 kilometres per hour. Copenhagen is the city of efficient cycling par excellence, and there at least, judging by its high and rising modal share, ‘efficient cycling’ seems popular. Understandably, if also problematically, we’re speeding cycling up to fit the world-as-it-is, rather than attempting to slow the world down, so cycling-as-it-is fits into it better. My main question here is: do we want cycling to be made efficient? My reason for asking this question: what happens to cycling in the drive towards making it more efficient? Speeding up cycling makes it more competitive, and thus potentially more attractive, vis-à-vis other modes. But what’s lost by these gains in time? I’m not disputing that cycling can be fast and efficient, and that’s sometimes why we ride. If I want to get from home to Lancaster University, 4 miles away, cycling is – for me – much quicker than any other means of getting there. But that’s not the only reason I choose to cycle, and to ‘sell’ cycling because of its speed is, I think, overly to instrumentalise it. I invoke Ruskin to suggest there’s a trade-off: incorporating ever more efficient cycling into an ever more efficient society probably takes some of the sheen off it; it risks turning cycling from freedom to chore. As cycling becomes more integral to the world-as-it-is, it becomes less able to transform that world for the better. Instrumentalisation of cycling in the name of efficiency is everywhere: using cycling to make cities less congested and polluted; using cycling to make people’s bodies more healthy and less obese; using cycling to bring tourist cash into the local economy; using cycling to announce our city as a truly ‘progressive’ place. We should be wary of attempts to encourage people to cycle because cycling is good for something else. For starters, I’m not sure it works. But also, cycling becomes something else to be marketed and sold, often by people who are selling and marketing it not because they love it, but because it’s their job. “I’ve ridden here, there and everywhere, breathing in and drinking up the city. It might have a lot to do with the time of year and the freezing conditions, but I’m struck by how utilitarian cycling in Copenhagen feels. Everyone rides as if they’re going somewhere, which of course they are. I’d like to return to ride in summer, to see how it differs, but what’s missing in my early December experience is the slow, lazy, loitering style of cycling which might actually build solidarities, communities and social capital. “It feels ironic that this is the city where Gehl Architects are located. Through work such as Life Between Buildings and Cities for People Jan Gehl helped teach me the significance of walking and cycling to civilising cities, challenging and transforming the dominant rhythmicities of cities. Yet here in his city of Copenhagen, people ride bikes like automatons. Often, I feel as though I’m on a conveyor belt I can’t get off. Everyone seems to know where they’re going, and they’re going there. They’re taking no prisoners, they’re not slowing down. “It’s the opposite of the cycling city as the relaxed, unhurried, people-centred city; this is the cycling city as the functional, efficient city, keeping the cogs of capitalism whirring round. I feel as though I’m on a capitalist treadmill; the bicycle keeps this city going, and it’s a capitalist city. Cycling here is about efficiency. It makes me want to rebel. “And they ride so fast! Maybe they’re trying to warm themselves up. OK, I don’t know where I’m going and I’m not used to riding such a clunker, but I’m not accustomed to being so regularly overtaken, and to overtaking so little. There’s no dilly-dallying here. And they come so close! The cycle lanes already feel narrow, perhaps because the snow and ice have encroached. But when a faster cyclist approaches from behind, there’s little room for manoeuvre. A few times I brush shoulders with an overtaking cyclist. After a while it feels less alarming, almost normal. Copenhagen embodies the dilemmas of contemporary cycling – particularly what it’s for. I’ve returned since, continue to find it stimulating, and continue to worry about the possibility of slow cycling. What happens to the slow cyclist – perhaps the older person pottering on her or his bicycle, or the idler, going nowhere in particular – in the rush to get more people to school, college and work more quickly? What happens to cycling as a ‘political’ tool of resistance to the society we’ve got, once the society we’ve got learns to use the bicycle to more effectively reproduce itself? I don’t want fast cycling eliminated. We need multiple rhythms of cycling in the sustainable city; not one monotonous cycling speed. Unlike cars, bikes are skinny, so there’s sufficient space within urban environments to cater for and cope with them travelling at multiple speeds. 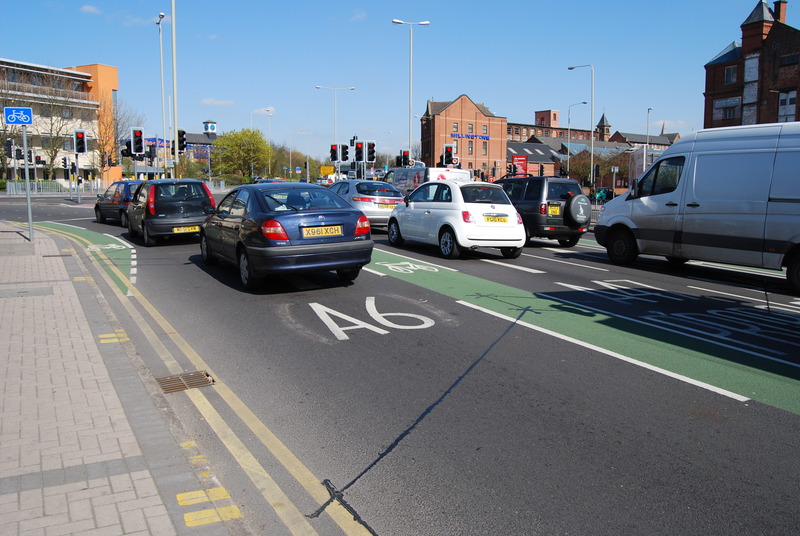 The Understanding Walking and Cycling project found that in the UK cycle lanes are needed to enable people who don’t want to ride fast and furiously (on ‘faster’ bikes) to instead ride slowly (on ‘slower’ bikes) along big and busy roads. Meanwhile, in Copenhagen cycle lanes seem oriented to making people ride not slower, but faster. This throws up questions about what dedicated cycle lanes are for, and why. In both the UK and Copenhagen it’s ridiculously hard to cycle sociably. In both places cycling conditions forcibly reduce the cyclist to the individual level, and reproduce cycling as a strictly utilitarian practice. This must change. Sociable cycling challenges instrumentalising logic, showing cycling can be more than getting from A to B as fast as possible. 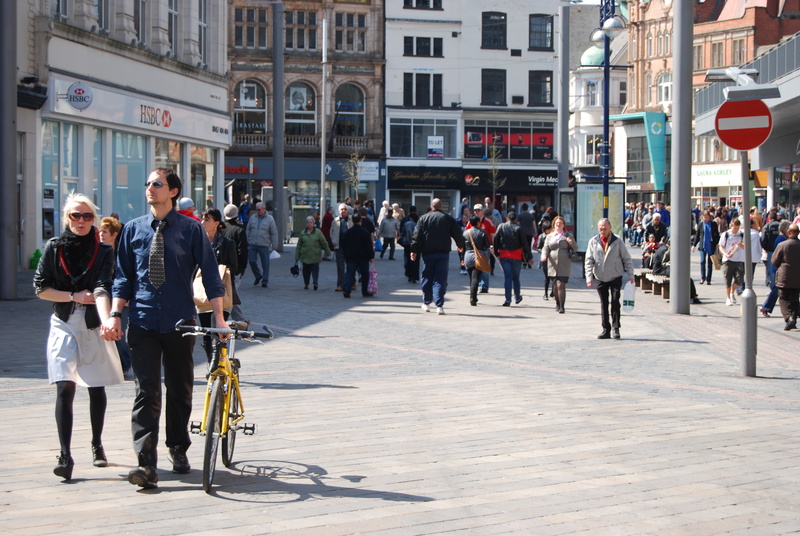 A civilised city would enable people to talk as they cycle alongside one another; a sustainable city would see it as unjust if people can do this when travelling by car, but not by bike. Everywhere there’s cycling (and cycling is almost everywhere) we should resist imposition of single speed solitary cycling; single speed solitary cycling is – effectively – what we’ve created in the UK and it stops many people cycling. And the instrumental logic behind cycling’s promotion in Copenhagen irons out and renders less and less visible any difference, and imposes single speed solitary cycling there. Only resistance – in the name of multiple speed, sociable cycling – will enable cycling to be democratised across differences of age, fitness, gender, and motive. Greater incorporation of cycling into urban space, at the car’s expense, potentially but not inevitably alters the character of that space. To see bicycles as no more than ‘skinny green cars’ is to reproduce the city much as it already is, and to miss cycling’s radical potential to change the world fundamentally for the better. Bicycles enable inhabitation of urban space in ways radically different to cars. Let’s not lose this difference. The bicycle shouldn’t simply be a substitute for the car, but a vehicle for re-working and re-shaping the city in broader sustainable ways; only then can the potential ethics (cycling’s contribution to the good life) and aesthetics (cycling’s contribution to pleasure) of the bicycle be fulfilled. 1. On waiting: what do we want to do about bicycles and waiting? Should waiting be extinguished? Does it reflect lack of accommodation of the bicycle in the urban transport environment? Or is the rush to erase waiting a symptom of an impatient, accelerating society? Should cycling reclaim waiting? Does it matter where you’re waiting, for how long, and why? 2. On cycling experience: when you cycle, are you moving through empty space? Or (to polarise) are you making your place in the world? Are you sometimes doing more of one and less of the other, and if so, why? Is cycling a neutral means of making your way in the world, or by cycling are you creating something? If so, what? 3. On cycling’s potential: do we want more cycling? Do we want cycling to change the world? Are they the same question? If ‘yes’, why? If not, why not? Should institutional efforts to boost cycling always be applauded and/or supported? Of course there’s a relation between the two, but have we been seduced by quantity (increasing the number of cyclists) and risk losing sight of the importance of quality (cycling’s contribution to a better society)? A few people responded to my recent posts on the concepts of cycling culture/s and cycling politics. One was Dave Barker. After some shorter exchanges, Dave offered to put his thoughts down at greater length. He sent me these a week or so ago, and has kindly agreed to me publishing them here. I want to share them because Dave’s thoughts are so well written, rich and insightful. It’s a long post, but I’m sure many people out there will find it stimulating, and for probably different reasons; the main reason I like it so much is because of Dave’s careful elaboration of how cycling in general, and club cycling in particular, has weathered – by adapting to – the ‘storm of the car’ over the past half-century, and is hopefully emerging now into a new dawn. For a while I’ve been interested in developing an oral history project around cycling. I’ve done the easy part, in dreaming up a working title – “Cycling lives: riding through the time of the car”; now ‘all’ I’ve got to do is find resources to put some meat on those bones! What I’d like is to hear from people who – like Dave – have ridden more-or-less continuously over the last half-century, to explore and understand with them the changes which cycling in general, and their own cycling in particular, have undergone during the historic phase of mass motorisation: partly to ensure such experiences are captured for the historical record; partly to ensure the historical record appropriately acknowledges and appreciates the roles and significance of cycling from the end of the Second World War into the present day; and partly because proper recognition of the battles which cycling and cyclists have survived in order to be with us still today can inform and perhaps aid the current rehabilitation of cycling. Whilst I don’t want inappropriately to recruit Dave’s fine writing to this nascent project, I do want to advertise my interest in the reflections and analyses of any one else who may be willing to commit them to words. Cycling – including our own cycling – has not proceeded immune to the car; to the contrary, cycling – or, more appropriately, cyclings (in the plural) – has – have – been shaped (not only constrained, but also – as Dave himself notes in making reference to how cyclists today tend to drive rather than ride out to races – enabled) by the car. By drawing on his own biography, Dave Barker does a superb job of analysing some of these processes, and I can’t thank him enough for allowing me to publish his analysis here. 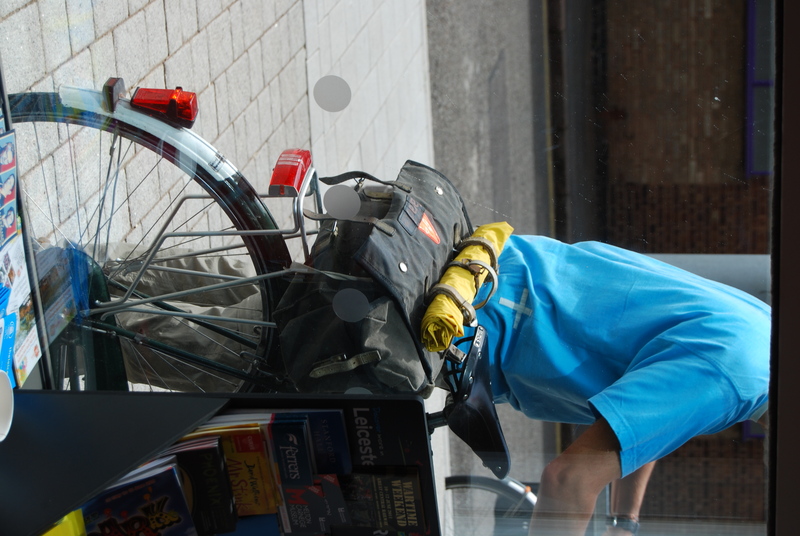 Whilst this is the first guest blog on Thinking About Cycling, I hope it won’t be the last. What follows aims to be historical/dynamic, but at the same time is unashamedly autobiographical. It also operates on the assumption that cycling cultures and practices have to be seen in relation to other relevant cultures and practices, particularly those of car drivers. The main argument is that our present cycling cultures are the product of the interaction between historical changes and forces over which we have had little or no control and the adaptations we have, collectively, made to cope with these changes and forces. Looking back, I now see a paradox at the heart of my experience of motorised road travel. On the one hand, as we now know, there were, relatively speaking, ‘no cars on the road’, so journeys ought to have been largely unaffected by the presence of other traffic. On the other hand my recollection of actual journeys (by coach in our case, since we didn’t have a car until my mid-teens) is that overall they were slow, leisurely affairs where rapid (?40 mph) progress on sections of open road were invariably punctuated by erratic movement, long snarl-ups and traffic jams in villages, towns and built up areas; so Birkenhead to London was an all-day (roughly 9 to 6) experience, which, of course, meant that there had to be built-in coffee/tea breaks, lunch stops etc to enable the punters to survive; Birkenhead to Llanfairfechan on the North Wales coast was pretty unpredictable, depending on how ‘bad’ things were in Conway and all the other bottlenecks along the North Wales coast, but I’m pretty certain that, even with an early-ish morning start, we could not expect to arrive until some time in the afternoon (60 miles). I can’t be certain, but I cannot imagine that doing the same journeys by car would have been hugely different. When we did, eventually, get a car, my Dad scarcely ever exceeded 35, and never on principle went over 40; yet I never remember long tailbacks behind us or the kind of furious reaction such driving would provoke today; so I infer that, while he was probably pretty slow by contemporary standards, he was not exceptionally or ‘pathologically’ slow. So my reconstruction of motoring culture and practice at that time is that it was the product of widely shared experiences in which a ‘long’ journey (in terms of distance) would now be seen as a short romp; acceptable speeds were, by present standards, very low; how long the journey would take was very much in the lap of the gods (but it would make sense to err on the side of caution and build in allowances for enforced, unscheduled stops/delays and plan additional stops for food and drink, if the experience was to be bearable); and the attitude to things and people that got in your way was that there were so many of them anyway, that it would make no sense to single out one category (e.g. cyclists) for particular blame or criticism; and, of course, most drivers were or had been cyclists. The Club and cycling culture into which I was socialised from 1958 reflected all this. Any cyclist worthy of the name would get to know the local (say 30 miles radius) lanes like the back of his hand, because these were where you sampled the real delights of cycling, and this knowledge distinguished you from the lower breeds like motorists who couldn’t read maps and hadn’t a clue where they were or where they were going except by using road signs and main roads. But at the same time you used the main roads: to get to the area where you really wanted to go; to train; to get in big distances; to link up nice sections in the lanes. So Anfield Club runs regularly used the Chester-Whitchurch road, or the main road from the Wirral to Queensferry and into Wales; Seamons Cycling Club runs in the 70s invariably did Altrincham to Whitchurch on A roads via Middlewich and Nantwich. Club 25s turned in the road (A41) between Broxton and Whitchurch on a Saturday afternoon. My first ‘really’ long ride (160 miles) was getting home to Birkenhead from Oxford. All I needed was an Esso map to clarify which A or B road number I needed to follow. Long distance tours (e.g.100 milesa day for four days round Wales at Easter) were not exercises in the finer arts of navigation. Using the main roads was often less pleasant than using the lanes, but the contrast was not such that you felt the need to avoid them, nor did you infer from the behaviour of most users that, as far as they were concerned, you didn’t really belong there. I started racing (1961) towards the end of the period when: most competitors rode out to the event (often carrying sprint wheels on sprint carriers); racing and club life were closely integrated, so that, for example, a club run would leave from event HQ when everyone had finished; off your local patch, you booked digs on a Saturday night, rode over on Saturday, raced, then back on Sunday (it was accepted that one of the responsibilities of an event secretary was to book accommodation for visiting riders who sent a deposit along with their entry form) (See, for example, the obituary of Johnny Helms, Cycling Weekly’s veteran and much-loved cartoonist). This gradually changed through the 60s: steadily increasing use of cars to get to events with knock-on effects on the rest of this social behaviour. Commuting by bike was very similar in the use of main roads, in my case into Manchester from the south-west suburbs using either the A56 (main Chester Road) or the A5103 (Princess Parkway). It has been interesting to me to find that this kind of experience was shared by top riders whose socialisation took place from the early fifties through to the early 80s (see e.g. autobiographies of Vin Denson and Graeme Obree). (Obviously there was much more to this culture than routes, roads and navigation, but this is what I want to concentrate on here). It is difficult to pinpoint how and when this changed, since we’re looking at something that was gradual and insidious, but I would say the late 70s and 80s were decisive. By the 90s things were very different. Although I was aware in a very general and unsystematic way that our collective behaviour was changing, the contrast was brought home to me very starkly in (I think) 1993 when I tried to replicate what I had done in 1965 (Oxford to Birkenhead with an Esso map), this time to get back to Manchester from the Tour de France in Hampshire in two days via Great Malvern (for a variety of reasons I had not done this kind of riding since the 70s). The 1965 experience was wholly positive and, looking back, quite formative in my subsequent cycling career and identity (in this case becoming a ‘proper’ cyclist – particularly a long-distance one – rather as others became marijuana users or jazz musicians [editor’s note – a reference to the work of the US sociologist Howard Becker, who applied the concept of ‘career’ any identity which requires work and commitment to develop]). 1993 was not an experience I would want to repeat and I began to reflect on the ways in which my significant socialisation experiences were quite simply not available to bike-riders following on thirty years later. When the motorways were being built, I remember that some cyclists were optimistic about traffic being diverted off the rest of the road system. With a few possible exceptions (A6 in Lancashire and Cumbria, A50 in Cheshire where A road and motorway shadow each other for an appreciable distance), these hopes have not been fulfilled as traffic levels increased and, with them, average and normal speeds, no doubt heavily influenced by the kind of thinking induced/encouraged by motorway driving. But not every kind of driving/journey has become faster and more predictable; the most obvious exception has been the typical urban commute. It seems to me that Fred Hirsch’s (Social Limits to Growth) concept of positional goods is particularly useful here. A positional good is one which is consumed only in part because of the intrinsic satisfaction it provides; it is also, indeed it is perhaps primarily, consumed because of the advantages the consumer gains over those who don’t/can’t obtain access to that good. The problem (logically unavoidable as well as empirically predictable) is that these advantages fall away and disappear as more and more consumers strive to acquire this advantage – hence there are social limits to growth. So we want a car at least in part because it enables us to travel further and faster than other people. At first this works; but it works progressively less and less well as more and more people get cars until eventually we get urban gridlock. Another important factor in the way that motorists have come to see themselves and behave has been the political context in which these changes have taken place. Until very recently (and it is debatable how far this has changed) much political discourse treated public transport as a residual service for unsuccessful losers; and it was widely assumed that those who walked or rode bikes did so because they couldn’t afford a car. The interests of motorists were prioritised in the way resources were distributed, in the philosophy/ideology/practices of traffic engineers and town-planners and in the legal system; and individualistic approaches to issues with political and social ramifications (like the decisions we make about whether and how to get from A to B) were celebrated as inherently superior to collective ones (although, as so often happens, while the benefits were enjoyed individually, the costs were socialised). So: cyclists came to be seen more and more as hindrances which get in the way and slow down a journey which ‘everyone knows’ should take x hours or y minutes and which, on this basis, may well have been scheduled to do precisely this. To make matters worse, groups of cyclists out in the countryside are clearly misusing publicly provided and financed space; ‘everyone knows’ that roads are there for the serious business of getting from A to B and here are these groups chatting, laughing and blatantly enjoying themselves, thus using the roads we have paid for as if they were subsidised playgrounds, and this frivolity is what is holding us up and making us late. (No motorist I have met has actually said this, but many do behave as if this is what they think; and to me, one of the most important aspects of our cycling culture is precisely this radical challenge it lays down to accepted norms concerning the proper use of public space). In urban areas, particularly in the rush hour, cyclists became obvious scapegoats with the build-up of frustrations associated with owning a positional good that conferred fewer and fewer advantages. To make matters worse, in many situations cheap bikes deliver the satisfactions the consumer is seeking better than expensive cars. The response of cyclists/potential cyclists to all this has varied: many have disappeared and many who would have appeared have not done so (how often have we heard some version of ‘I used to be a cyclist, but you wouldn’t get me out on a bike on these roads. It’s far too dangerous’?). The primary adaptive response of most leisure/club cyclists that I know has been to retreat almost completely from the main roads (except in the mountains) and take to the lanes and (more recently) sections of the National Cycle Network (NCN). One big bonus is that navigational skills have improved significantly. I think I am now a better navigator than my dad was, if only because the cost of getting it wrong is so much greater. (I went back to Oxfordshire a few years back, armed as I always am with an Ordnance Survey (OS) map; I behaved as I now always do and used the map to navigate the lanes; it was astonishing (and at first a bit upsetting) to find myself on routes and in places that I had never been on/to and didn’t know existed. How could I have missed such gems? Then I reflected that at 18 to 22 I had been a completely different sort of bike rider doing what was then my thing in an (almost) totally different world. As I said in an earlier post [editor’s note – see Dave’s comments, dated 26th June 2011, to my post ‘A cultural politics of cycling, part 2’], I didn’t choose to live through the era which forced these changes on us, but I am proud of the adaptations we have made to cope with them). For many urban cyclists similar adaptations have been necessary on the commute as we have cobbled together safer, quieter, less stressful, and often much more ingenious and interesting routes to work and for other journeys round the urban areas. It is particularly gratifying to me that a crucial bit of contraflow on a pavement (where I was stopped by a policeman in the 80s) and a pedestrian-only bridge that many of us also used illegally are both now part ofManchester’s official cycle network. They all learn in the end, even councillors and traffic engineers. Other adaptations involved collectively choosing to go with the flow. We can’t blame motorists for the fact that virtually no one now rides out to races; racing cyclists have taken full advantage of a road system on which higher speeds and shorter, more predictable journey times are pretty much guaranteed. And just as virtually no one rides out to race, so far fewer club riders go out on all-day club runs. (Johnny Helms racing on a Sunday morning, then going out all day with the Warrington Road Club and typically clocking up 120-150 miles for the day was a product of the 40s and 50s; he had fewer and fewer successors in the 60s; he and his like were probably extinct by the 70s) In my club 85/90% of the (hugely increased number of) riders going out on a Sunday morning are back home between 1 and 2pm. A casual glance at the club feature in Cycling Weekly indicates that this is now the norm. I said earlier that potential cyclists who would have appeared did not appear. Another ‘crisis’ we had to deal with in the Clubs was the almost complete disappearance of junior recruits in the mid-80s. It seemed almost to be the case that one moment the club room and the club run was heaving with juniors, the next there were none to be seen (I was club chairman at the time and got quite a lot of stick from some senior members who seemed to think that it was us – or me – who were/was doing something wrong. Further scrutiny showed that this was a problem that affected all clubs and many other sports). In our case, however, membership numbers stayed high and even increased as we recruited ‘returners’ and others who have taken up the sport in their 20s and 30s (or later). In the last few years we have been getting juniors as well. The other most obvious feature of cycling culture in the last 20 years has been its growing heterogeneity, with the mountain bike explosion, triathlons, orienteering-type events, families on the NCN/Sustrans network, sportives etc etc. One of the problems confronting anyone wanting to analyse it is to get a grip on what is going on (and this is just the sport/leisure side). Cycle forums, cycle campaigning, the green movement and other forms of activism are also arenas in which bike-riders who maybe 30 years ago would have behaved pretty much as atomised individuals are now starting to act collectively and politically. When I taught Social Policy courses, one of the areas we used to discuss was the way in which politically conscious disability groups began to challenge the view that handicap, disadvantage, exclusion etc are inherently and inevitably part and parcel of having, say, a visual or a mobility impairment; rather it is the environment which the rest of us (the able-bodied) create (on the assumption that everyone is able-bodied like us) that disadvantages and discriminates against those who are, in these respects, not like us. To my embarrassment, it was fully 15/20 years after I had started presenting this kind of analysis, that I began to appreciate that it could be adapted and applied much closer to home. Environments are created to suit the interests of powerful, dominant groups (motorists), ignoring the interests of less powerful, subordinate groups (cyclists and pedestrians). And rather as the disabled were invisible because they had to stay at home, so cyclists and pedestrians became more than invisible; quite simply people stopped cycling and walking. What we are now seeing are early signs of raised consciousness and resistance. When my mates and I started serious cycling as teenagers, one of our ambitions was to be treated and accepted as proper cyclists, which obviously and necessarily included being thought worthy of a wave and an ‘aye, aye’ when we passed those who were clearly ‘proper cyclists’. Because we wore jeans and started off on relatively grotty bikes we didn’t always pass the test and were often ignored; we found that this was much less likely to happen (in fact it virtually never happened) once we acquired better bikes, a pair of Ossie Dover’s plus-twos and garish diamond-patterned knee-length socks (Ossie was Liverpool’s famous tricycling tailor). And then it was our turn to ignore the plebs (after all we had been through, why should we dispense our favours any more liberally?). I have to confess that I remained an arrogant, elitist, condescending prat right through the 60s, 70s and into the 80s. It is hard now to recall when, how and why I started to change, but I am pretty certain that it was as I started to appreciate that, where cyclists are concerned – unlike Britain in 2010/11 – we really were ‘all in this together’. Now greeting and chatting with a far greater range of people on bikes is a way of expressing solidarity, camaraderie and shared experiences and interests. This has been a long-winded way of saying that the cycling culture which I grew up in on Merseyside in the late 50s and 60s has undergone fundamental changes, many of which were forced on us by what might loosely be called the motoring culture; I have argued that we have resisted and adapted; and it may well be that what is emerging is stronger, if only because, in rough and ready Darwinian terms, it now contains far greater variability. This is basically why I view the possible emergence of mass cycling (and a mass cycling culture, whatever that might look like) with a combination of equanimity and enthusiasm. Enthusiasm because this can only be good for public health, the planet, my grandchildren, urban life, and civility and sociability; equanimity because I cannot readily conceive of ways in which lots more people riding bikes in urban areas can have serious detrimental effects on our various cycling subcultures. I take this view mainly because in places where there is mass cycling, this has happened (as far as I can see) pretty well independently of the kind of leisure/sporting/competitive cycling cultures which exist in those cities/countries. My analogy would be that if we also get mass walking/pedestrianism or whatever we might call it, there is really no reason to believe that this will have much effect on the diverse cultures of rambling clubs, athletics clubs, fell-running clubs, long distance walking clubs etc etc. But I also take this view because, compared with what we have been through since the 50s/60s, coping with the consequences of mass cycling will, in all probability, be a bit of a breeze. In the end it will be up to us, or rather you, how we/you adapt to these (and any other, possibly far more momentous) changes which take place over the next, say, 50 years. Dave Barker is 68; he was lucky to have a bike-riding Dad who guided him into club cycling on Merseyside when he was 15. He got involved in most aspects of the sport and was an above-average time-triallist (high spot: British Students 100 champion, low spot: personal best of 1.00.02 for a 25!). He commuted by bike to Manchester University (room smelled like a race HQ). Member of the 300,000 miles Club and did London-Edinburgh –London in 2001. Now President of Seamons Cycling Club, Altrincham; involved in cycling campaigning and a volunteer on the Sustrans National Cycle Network. Into jazz and grandchildren when not on a bike. For more than half a century cycling has been marginalised. Marginalised practices tend to produce marginalised identities. To be a cyclist puts you on the edge. And we develop attachments to, and build cultures around, our marginalised identities. We own and cherish them. But at our forthcoming event in Leicester, Building Cycling Cultures, these identities become stakes in the struggle to push cycling into the heart of future sustainable cities. How do we simultaneously preserve what’s important about our cycling identities, practices and cultures, which are to some extent currently marginal and discriminated against, at the same time as attempting to extend those identities, practices and cultures so they become less marginal, less discriminated against? How in other words, do we negotiate the tension between a gain for cycling (becoming more mainstream) and a potential loss for ourselves and the identities, practices and cultures which we’ve over the past half-century developed, and developed in part as strategies to enable cycling to survive? Must we sacrifice the cyclings we’ve built and which we love at the altar of a vision for mass cycling? No doubt other sub-cultures have faced this dilemma – of how you democratise a desired practice without jeopardising the identities which have been co-produced alongside that practice, and which – like all identities – now form a crucial component of individual subjectivities; you can’t strip someone of an identity without doing violence to their self; you can’t challenge an identity without potentially destabilising the person’s (always to some degree precarious) sense of self. This dilemma was evident during the research I conducted towards my PhD, over a decade ago now. There I explored the everyday lives of environmental activists, myself and Sue (my partner) included. Through a range of ‘ordinary’ practices (shopping, cooking and eating habits, recycling, ‘work’/’leisure’ practices, transport …) environmental activists contribute to a radically transformed (relatively ‘local’, remarkably ‘low consumption’ and ‘green’) everyday life which could – when aggregated – help build a culture of sustainability. But the re-orienting work (away from ‘unsustainable’ practices of the dominant culture and towards an alternative range of sub-cultural and ‘sustainable’ practices) required to develop such a ‘green’ everyday life tends simultaneously to build cultural identities which are marginal, elite (at least from an ‘outside’ perspective, which tends also to view such cultural identities as ‘self-righteous’), and difficult to popularise. It’s a terrible dilemma – you want other people to do something you do, but the road which you’ve made to get to there looks, to those who you want to follow you, full of obstacles. We also develop attachments to our marginal identities, and the urge to democratise those identities must struggle with an opposite urge, to preserve their exclusiveness. This tension, between the urge to proselytize your privileged practice on the one hand, and to preserve its exclusiveness on the other, exists in cycling today. As people who love cycling we’re initiates, part of a small, select club. Together we produce distinctive cultures, and like all cultures these cycling cultures value particular ways of being, talking, doing and dressing more than others. There’s nothing wrong in this. It’s what people always and inevitably do. But we should recognise that the knowledge, skills, competencies and tastes we’ve acquired through participation in cycling have been earned gradually, over time. And at the collective level our continuous investments in cycling have produced cultures which can then appear to ‘outsiders’ to be difficult to penetrate, or worse, ‘elite’. Cultures and sub-cultures tend to develop strategies for dealing dismissively with those trying to take short-cuts to accrue the kinds of capital on which they trade. The ‘nouveau riche’ provoke disdain amongst those who consider themselves ‘properly monied’ and more ‘culturally sophisticated’. Similar strategies go on in cycling, and I leave you to think of examples based on your own experiences. My point is that, if we want to democratise our practice rather than build barriers to it, we’d do well to reflect critically on our own attitudes and practices here. Because if cultures (and particularly sub-cultures) inevitably create boundaries to ‘outsiders’ during the continuous process of their production and re-production, they can also develop strategies to facilitate and enable others – ‘outsiders’ – to become involved. And if we want to popularise cycling, this is something we must do. Should you have read this far you might (quite fairly) think I’m being overly earnest about all this. I’d respond by asking you to take a look outside. If where you live and work is anything like where I do, you’ll see many cars – both parked and moving – but few, if any, bicycles. How great is our task depends on how seriously we take the need to turn this situation around. Or, to use the terms I’ve been using thus far, the extent to which we’d like to make the dominant mobility (the car) sub-cultural, and the sub-cultural mobility (the bicycle) dominant. If you’re anything like me, the drive (?!) to promote cycling is almost an instinct, by which I mean something which feels right to do and which happens almost automatically, of its own volition. I rarely if ever stop to think why I want more cycling. After all, couldn’t it equally be the case that – much like driving – by democratising it you simultaneously start to erode some of the benefits it currently provides? So what’s behind the impulse to popularise cycling? What happens if we seek to prise open, in order to examine and explain, this democratising instinct? Or we might refuse to implicitly condone the generally taken-for-granted and so submerged (from the popular conscience) damage and destruction which motorised vehicles wreak. Whatever our reasons for seeking change, as people who (I’m assuming) cycle and love cycling, we have an additional and important vantage point – we have direct personal experience of a vehicle that is an obvious but more perfect substitute to the car. We know the bicycle can replace the car, because much of our own everyday lives demonstrates that fact. What’s our specific role, as people who love cycling? Do we have a privileged position, in effecting change? What do our experiences as cyclists tell us needs to change? In effecting change what’s the significance and value, if any, of our skills, competencies, knowledge, enthusiasms, energies, convictions, imaginations and visions? These are some of the questions we might think about as we attempt to move cycling from a minor to a major mode of mobility. They’re questions which have to do with not just practice, identity and culture, but also with politics, social change and transformation. Cycling is cultural, and there’s a cultural politics of cycling. I think it’s worth sketching the contours of this cultural politics of cycling because, if we know the terrain better, it might help us articulate a more powerful and persuasive politics of cycling. So the questions above are the sort which I hope we’ll explore at Building Cycling Cultures next weekend in Leicester. They’re certainly questions which I think are important to think about as we – and by ‘we’ I mean mainly those of us already passionate about and in various ways involved – continue and develop a project of building out from a range of vibrant but still small cycling sub-cultures towards an equally vibrant but qualitatively different and really massive cycling culture. There’s a real tension in the concept of building cycling culture/s. I think that such a tension is good, because it can be productive, but only if we work with and on it …. Britain undoubtedly has a myriad of variously well established cycling cultures, from the recent (re)turn to fixed-gear urban riding, to club-oriented cycle-tourists, to competitive cycle sport, to cycle campaigners, to BMX …. you get the picture. I’m not especially well embedded in any, but I flirt with and love them all. I also think we should celebrate such cycling cultures – after all, they have, perhaps more than anything else, kept the idea of cycling in Britain alive across the past half century which has otherwise been steadfastly and furiously committed to stifling the desire to cycle, and extinguishing cycling’s existence completely. But now, just perhaps, there are signs of the aggressive and increasingly institutionalised repression of cycling finally lifting. Cycling is coming up for air. And we lovers of cycling can look around, not just over our shoulders but also ahead. For the first time in almost a century we can broaden our gaze, we can look beyond the horizon in the knowledge we’ll be pedalling all the way. We can simultaneously sigh with relief and dig in, thinking about the way forward for cycling now that it’s no longer quite so clearly something to be simply trashed. So whilst we still might whisper it, one day soon I hope it’ll feel safe to declare – loudly and to anyone at anytime and anywhere – oneself to be a cyclist. We have survived the storm and although another one (climate change) is coming we can pedal towards it safe in the knowledge that at least our vehicle is right. Given cycling’s potential resuscitation it seems obvious that we should now work hard to promote these existing cycling cultures, to make them bigger than they already are. So that more and more people discover the pleasures of commuter cycling, or cycle-touring, or cycle-racing, or BMX, or mountain biking …. This is what those of us who love cycling, myself of course included, tend to do. And I think we’re right to do so. 1. 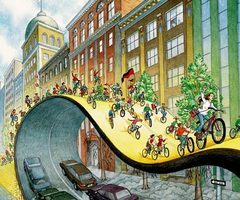 Do existing and often remarkably resilient cycling cultures represent the seeds from which mass cycling will grow? Can we harness the undoubted enthusiasms, energies, commitments and imaginations of people who are currently if in different ways passionate about cycling, in order to broaden cycling’s cultural appeal, and transform it back from a range of sub-cultures to an important and normal part of the dominant culture? And if so, how do we do so? 2. Or instead, are existing cycling cultures obstacles, in the way and to be left behind as we attempt to push cycling into a new golden age? This attitude appears to be on the rise. It’s certainly apparent amongst many champions of ‘ordinary’, ‘everyday’ cycling who tend to see strong cycling sub-cultures as an impediment to cycling becoming regarded as ‘normal’, a practice which just anyone can do. I’m suspicious of this antagonism towards certain sorts of cycling/cyclists amongst people who profess to like cycling. I also resent it. We’re now in the position to resuscitate cycling only because it has been kept alive and meaningful for many groups of people in many different ways. Why on earth should those of us who love cycling, who have cycled all our lives, and who might sometimes wear lycra or like to ride fast, or do things which most people would consider difficult if not impossible, why should we be sacrificial lambs to the slaughter at the altar of mass cycling? The suggestion that wearing lycra is bad for cycling is preposterous and I think belies a disturbing way of thinking. However, this defence of cycling cultures shouldn’t stop us from asking important questions. Does, for example, the current dominance of cycling by people who are clearly fit and committed somehow prevent it from being embraced by those who are neither? And if so how, and what might we do about it? What strategies might be adopted in seeking to transform the sub-cultural into the mainstream? 3. Finally, is there a synthesis? Can the old cycling sub-cultures and the new culture of mass cycling co-exist and co-evolve, each feeding the other? This is obviously the ideal outcome, so I desperately want the answer to be ‘yes’. And what I have said up until now I hope suggests that, with appropriate thought and strategising, the answer can be ‘yes’. Existing cycling cultures can inform and boost attempts to build a broader, more inclusive, mass culture of cycling in Britain. An important test here might be whether we can detect democratising impulses within the sensibilities and practices of actually-existing cycling sub-cultures. So can we? I think we can. I see this democratising impulse every Thursday evening, when with my family I ride out to Salt Ayre cycle track, half way between Lancaster and Morecambe. Lancaster Cycling Club has come together with the local children’s cycling club, Salt Ayre Cog Set, to put on time trials which cater for everyone. My daughter Flo is 7 and rides a 2 mile time trial. My son Bobby is 9 and rides 6 miles, whilst my partner Sue and I ride the 10 mile version. Both clubs are extending themselves, in a bid to make cycling more accessible to all. Another example is provided by the bike co-ops emerging across Britain. 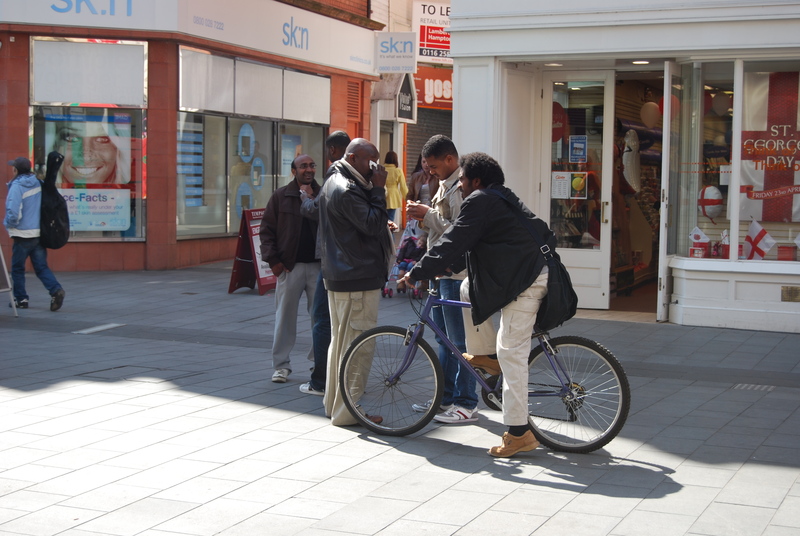 To give just one example, Oxford Cycle Workshop is committed to enabling more people to take up cycling. Through recycling bikes, providing people with the skills they need to maintain and build bikes, and through nurturing an inclusive space which welcomes everyone, Oxford Cycle Workshop and similar enterprises are committed to building a mass cycling culture. Such enterprises form an essential part of the bike system which we’re now developing as a replacement to the increasingly defunct car system. 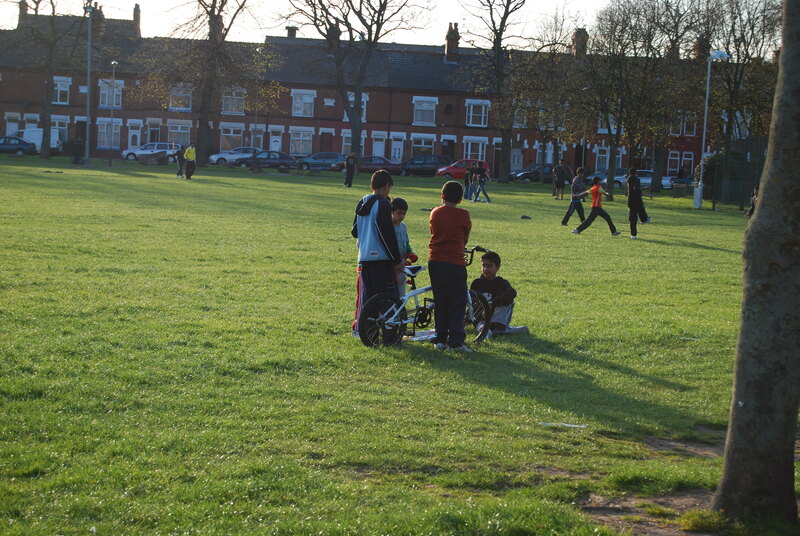 But for me anyway, this is one of the main things which our forthcoming Leicester event is about. By bringing together a broad range of people with different involvements in cycling, we can discuss and develop strategies for how best to push cycling towards the next level – everyday, popular, mass cycling. How big can cycling get, and how do we get there? How might the size of cycling affect what cycling looks like? Building a British cycling culture: can Copenhagen show the way? my responses to Richard’s questions, which I’ve just composed. It makes for a rather long post, but you’ll see how it’s broken up into those three separate blog posts. I was in Copenhagen last week, for a meeting of the Danish research project, Bike-ability. Ezra, who works on the project, kindly sorted a bike for me to ride around Copenhagen the next day, so I could get a cyclist’s view of the city. And what a beautiful day I had! Cold, sure – very cold (especially my feet, despite packing my best cold weather socks – woolie boolies), but blue sky and sunshine bathing the Danish capital in glorious light. I don’t usually ride this style of ‘sensible’ bike, but straightaway I liked how suited it felt to the ‘difficult’ conditions. It felt solid and chunky moving over the ice, and the step-through frame gave me confidence that, should I slip, I’d be able quickly to dismount. A big difference between the UK and Copenhagen is the treatment of cycling infrastructure. In the UK, cycle routes are very rarely cleared of snow and ice. This means that, in conditions such as those we’ve been having recently, people who ordinarily cycle either stop cycling and find some other way of making their journeys, or they are pushed into using the main roads. It’s a different story in Copenhagen. Some of the back streets weren’t clear, but all of the main arterial cycle routes I rode were. Apparently there were far fewer people cycling than would usually be the case, even in early December. But again, from an English perspective, huge numbers of people were riding bikes. I stopped often, to watch them flowing through junctions; a beautiful sight, graceful in its silence and wintery light. But yes, the numbers of people cycling … very many. I knew it already, but participating in it is another thing – Copenhagen has developed a ‘mass cycling culture’. Cycling is ‘mainstream’ here. I’ve no doubt that the kinds of people you see cycling will vary according to the part of the city and the time of day and week. Where and when I was riding I seemed mainly to be surrounded by younger people, more women than men; many students, I assumed. I stayed behind and followed some, not as a stalker but as a sociologist! Others I overtook, many more overtook me. It was partly because I was new in the city and unclear on where I was going, and partly due to riding an unfamiliar bike, but along the main arterial routes into and out of the central city I felt I was pedalling a treadmill (to mix a metaphor!). Once I was on one of these cycle lanes which aim flat and straight, it felt hard to get off again. The snow had narrowed them, and people overtake, coming past really quite close, which increased my sense of being ‘hemmed in’. There are important and intersecting tensions here, between ‘freedom’ and ‘confinement’, and between ‘the mass’ and ‘the elite’. It is crucially important how we negotiate these tensions across the world, as we move towards producing cycling as a major means of urban mobility. But my elitist orientation to cycling in the city is antagonistic to (my ambitions for) cycling as an ordinary practice – one we need huge numbers of people to embrace in order to move towards a planet on which human habitation is viable over the long-term. 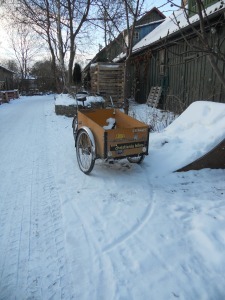 I have two highlights from my day spent pedalling around Copenhagen. 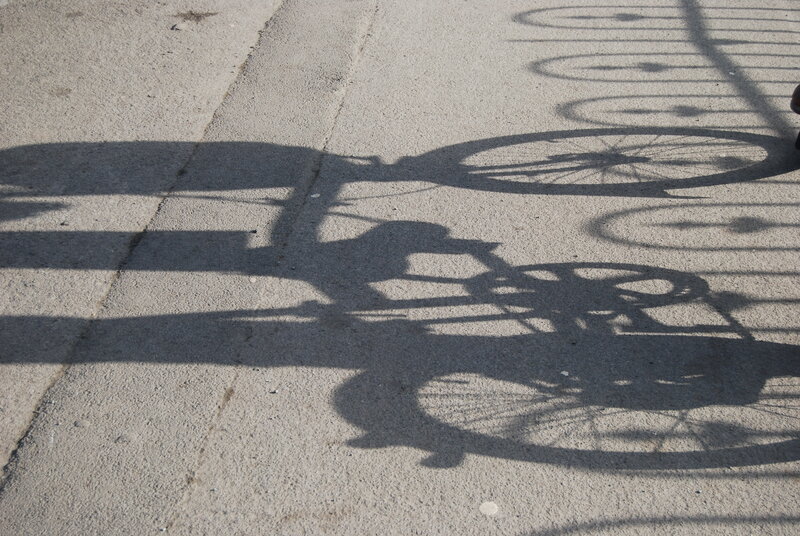 The first is that I spent a day pedalling around Copenhagen (which maybe makes it a longlight ..). The second is getting to visit Christiania, a place I’ve long wanted to go. 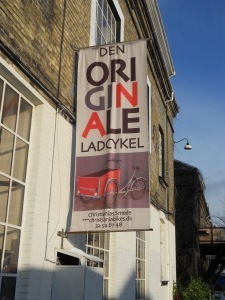 Christiania is of course the home of Christiania bikes. I love cycling and I love all those who work in creative ways towards alternative, progressive, socially and ecologically liberated futures. So this is my kind of place! I’m also a sociologist, and although I recognise that I’m not always – or even often! – very good at it, I like to think critically. I am fond of Denmark and the Netherlands, I love cycling in both countries, and I love how useful and stimulating they are to thinking about cycling and cycling futures. Heaven help us if we didn’t have their shining examples. But I’m sometimes puzzled how the Dutch and Danes seem resistant to opening up their cycling practices to critical scrutiny. Amongst many of the Dutch and the Danes whom I’ve had the privilege of meeting, cycling’s something people simply, unproblematically just do. Sociology cracks open and scrutinizes such taken-for-granted, common-sense perspectives, not to reveal them as false but in order to understand better the complex processes through which they’re constructed, maintained and, yes, routinised. So what I most love about Christiania and its bikes is how as a concrete place it provides evidence, both ‘actually’ (materially, in the form of a factory) and symbolically (culturally, in the form of the production and reproduction of particular ethics, aesthetics, sensibilities) of how a cycling culture gets built. Very interesting post, David. I am struggling a little with the contrast between what you say here (in which you essentially like Copenhagen’s cycling culture even if it’s not for you) and what you infer in your five part article regarding the fear of cycling, published on Copenhagenize.com. My questions are, (aside from your dislike of being ‘constrained’) do you on balance actually like Copenhagen type infrastructure or not, and if you do, then can you see it happening, albeit to a limited extent, in the UK–on condition of design excellence and other conditions as you see fit? From your professional perspective, can you see dedicated infrastructure (as opposed, for example, to networks of streets with ‘filtered permeability’ as in London) having a significant effect on levels of cycling? Do you think we have reached a stage where the fear of cycling in society, and indeed public and media ‘aggression’ towards cyclists as an ‘out group’ is now so embedded that only dedicated infrastructure can produce the ‘next wave’ and the ‘normalisation’ of cycling? For my part, I was one of those people who was ‘anti-segregation’ for the reasons you’ve outlined until I visited Copenhagen, and now I’m unsure. I thought the approach taken in the Netherlands was somewhat ‘gold plated’ and therefore unlikely to be achieved in the UK. Copenhagen appears to demonstrate a highly achievable example: the design of infrastructure is simple and continuous, and features the repeated application of simple design principles. I particularly like the treatment at many junctions (share the right-turn lane with motors), which minimises conflict without adding extra signal phases. And I can see the system being implemented on selected major routes into and around Central London and outer London town centres, subject to some design improvements for pedestrians. However, on the other hand, I also agree with the ‘Bikeability’ cycle training approach, which trains cyclists to ride in vehicular fashion, sharing the carriageway with motors, and to overcome their fear of motors (a fear that is highly embedded in our society). I’m unsure of the long-term benefits of this: certainly riders become more confident and it’s been shown that they ride in a wider variety of contexts (progressing from all off-road to riding on quieter streets, for example). But should they find themselves being intimidated or in a close shave once too often, might that confidence ebb again, especially if there is an intervening break in cycling? My suggestion, which I would like you to consider, is that good infrastructure for cycling in the UK is a mix of all things: where cyclists ride the streets and roads with motors, then motor traffic speeds should be reduced, enabling fearless sharing; where direct arterial road routes provide the shortest link to key destinations (and the alternative routes are indirect, perceived as unsafe at night, or difficult to follow), then Copenhagen-style infrastructure should be provided where there is sufficient width and measures should be taken to increase the relative convenience of cycling compared with other modes, by introducing networks of ‘modal filters’ (road closures with gaps for cyclists) to maintain direct access for cyclists and reduce route options for drivers. The key thing in any event, it seems to me, is good design of public spaces. I don’t think we should consider ‘cycling’ or indeed ‘walking’, ‘using public transport’ or ‘driving’ in isolation–movement is not an end in itself. I like the Copenhagen philosophy that actually ‘quality of life’ is what should drive policy development and decisions. It’s a holy grail, of course, since the problem we have in the UK is a cultural ‘silo’ mentality of ‘functionality of space’ and humans as the ‘units’ that ‘require mobility’. When the functions of planners, transport planners, designers, and so on are properly linked, by an enterprising political leader perhaps, as in Copenhagen, then perhaps you might agree real progress towards a cycling society can be achieved in Britain. Thanks very much for such a thoughtful response to my observations of Copenhagen, and for so considered a set of questions. I will try to respond directly to your three specific questions. 1) Do I like Copenhagen’s cycling infrastructure? Not really, no. But whether or not I like it seems slightly irrelevant. My main consideration is whether or not it transforms – or has the potential to transform – the city. And here my response is ambivalent. Currently I do not think Copenhagen’s cycling infrastructure is transformative, and before talking to a range of experienced and knowledgeable people in Copenhagen I doubted the potential for the city’s approach to cycling infrastructure progressively to de-centre and displace the car. But now I am less sure of myself – precisely, I have more optimism that Copenhagen’s approach (the provision of segregated space for cycling, which means people are effectively pedalling down narrow urban corridors – in relative ‘safety’ but also in relative ‘confinement’) contains both the ambition and the capacity to move beyond the model of the corridor, and incrementally to re-colonise ever more urban space for people, and thus de-privatise it from the grip of parked and moving cars. 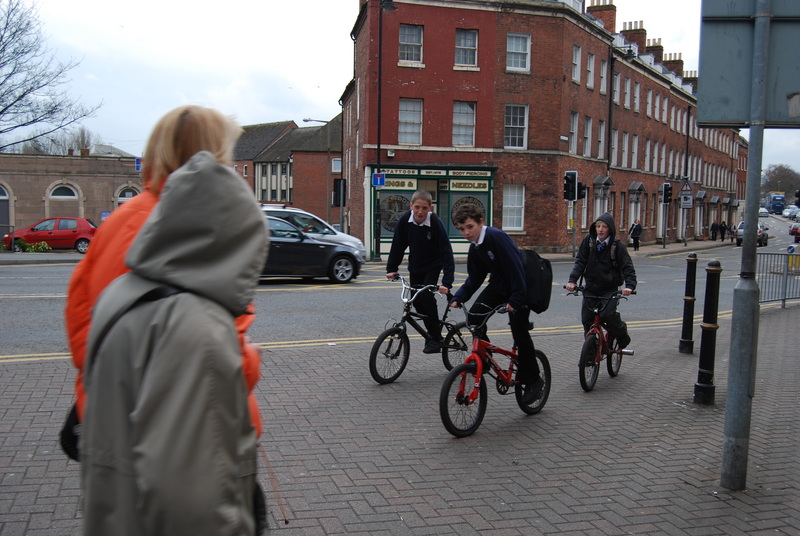 2) Would, in the UK context, dedicated cycling infrastructure increase cycling? Yes, I think so. For the last year my colleagues and I have been doing extensive and intensive ethnographic fieldwork in four English cities, and we have talked to many, many people who say (and I believe them!) they would like to cycle but are too afraid to do so under currently dominant cycling conditions. 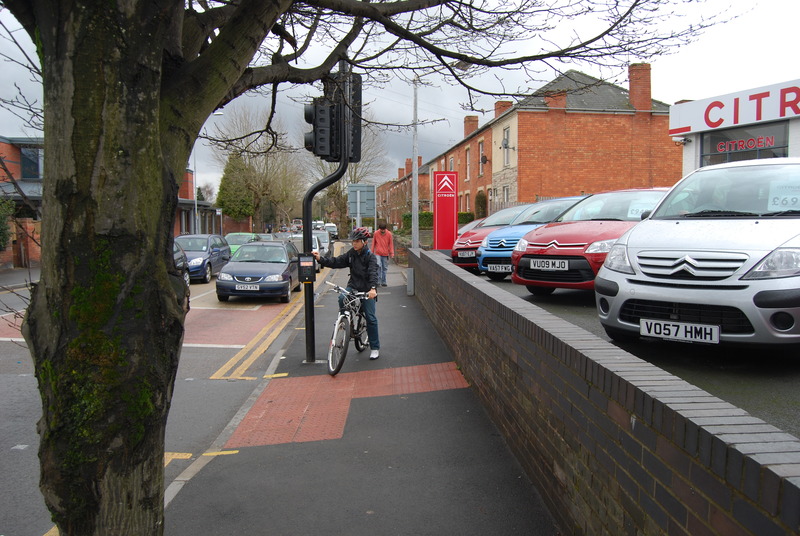 The provision of dedicated, segregated cycling infrastructure is an obvious mechanism for helping such people cycle. But I would emphasise, it is only one such obvious mechanism. Such provision should be just one of the tools in our kit for getting Britain on its bike. Here I wholeheartedly agree with your suggestion that such provision makes most sense along wider, key arterial routes, and should comprise part of a cycling network which embraces the existing – but hugely civilised (through for example slower speed limits and changing cultural sensibilities and legal responsibilities across different mobility users) – road network. 3) Because of the precarious state of cycling, is dedicated infrastructure the only realistic way of triggering a step-change in cycling in the UK? My response to this question depends on my capacity to imagine a set of British politicians prepared to bite the bullet, and instigate – and then survive – a broader and sweeping portfolio of progressive changes to Britain’s transport environment. Because if UK government is capable of civilising the car, then no, we do not need a comprehensive dedicated cycling infrastructure (there will always be a case for some, selective, such infrastructure) – Copenhagen has such infrastructure because it was not prepared so to civilise the car, although clearly it has managed to ameliorate some of the car’s worst effects. However, adopting a (slightly!) more pragmatic perspective, then yes, I think the installation of very high quality segregated cycling infrastructure along key arterial routes within and between British cities, alongside a range of other measures, is perhaps the way most effectively and quickly to reach a tipping point for cycling, which can trigger its elevation to a qualitatively different level (in terms of both practice – say, 20% of all urban journeys across the UK by 2025 – and perception – so that cycling becomes a perfectly acceptable and unremarkable thing for anyone at all to do); i.e. the ‘normalisation’ of cycling. This range of other measures would include the implementation of slower speeds (30 km/hr) across the rest of the road network, and would be aligned with other changes; infrastructural (such as modal filters, as you suggest), legal (such as stricter liability rules), and cultural (such as the adoption of cycling amongst high-profile charismatic individuals, and the consignment – and commensurate stigmatisation – of ‘cyclist-baiting’ to the most reactionary fringes of the gutter press). In general, I seem increasingly to be moving towards what I’d call a ‘messy vision’ for cycling in the UK. By this I mean that getting Britain moving by bike will require many different interventions, which produce multiple (and potentially unpredictable) synergies, which together ‘spin’ us into a qualitatively new transport culture. Relatedly, I seem also increasingly to be adopting a position marked less by fixed adherence to some model over another (which when it comes to debating ‘the proper place of cycling’ (on or off road; integration or segregation) in the UK might be seen as a hindrance to debate about progressive cycling futures), and more by recognition that a heterogeneous rather than homogeneous ‘cycling system’ might be the inevitable and best outcome of our current and future efforts. But going back to the thrust of your questions, I think increased provision of specific and segregated cycling infrastructure might be key to getting the velorution rolling. The current and massive problem with otherwise wonderful initiatives such as Bikeability (a UK cycle training scheme, not to be confused with the Danish research project of the same name!) is that, given the existing cycling environment, we’re destined to lose the vast majority of those we train. However well we train them, only the hardy minority will stay on their bikes for long. We have strategically to crack, and then mine, the current dominance of car-based urban automobility, and the establishment of cycling corridors – a la Copenhagen and (in a fashion) London – on key, highly visible arterial routes seems one way of doing so. Finally, can I alert you to an upcoming event designed to explore these kinds of question? ‘Building Cycling Culture/s’ is taking place at The Phoenix Digital Arts Centre in Leicester on Saturday 4th and Sunday 5th June 2011. I’m co-organising it with Rachel Aldred, who leads the ‘Cycling Cultures’ research project at the University of East London, Andy Salkeld of Leicester City Council, and John Coster of ‘Citizens’ Eye’. We’ll be announcing further details soon, but suffice to say our vision is both to recognise and celebrate the myriad ways in which many people are currently working for cycling, and also to explore and debate what now needs to be done to produce in the UK a broad and inclusive cycling culture. They’re some thoughts pretty much off the top of my head – but I hope they clarify my views (though as I hope I’ve suggested, my views are always under construction and in formation …. ), and that we have more debate over these and similar matters into the future. There were participants from across the planet – South Africa, India, Australia, the US, Spain, Denmark, Ireland and Italy – as well as from across the UK. And they came from many walks of life – activists, students and academics, transport planners, cycle trainers and bike co-op members. What united us was a passion for cycling, and a belief that cycling can change the world. Aurora and I found it a pleasure and a privilege to host, who knows?, perhaps the world’s first ever gathering dedicated to thinking rigorously and politically about cycling and its potential. An event which brought together in space and time so many people, with so much experience, knowledge and commitment – how could it not be ace? Day 1 kicked off with a paper from Andrew Millward, a cycling historian and Secretary of the Cycling History and Education Trust. Andrew reflected on the battles for recognition and justice which cyclists in Britain fought between the First and Second World Wars. Cycling groups resisted proposals to make the fitting and use of red rear lights on bicycles compulsory, just as they resisted proposals to push cycling off the roads. These proposals were viewed as governmental attempts to discipline, control and marginalise cycling, and to reduce the sense of responsibility speeding motorists felt towards the safety of cyclists; the analogies with the helmet debates of today are clear. Day two started with Jennifer Bonham of Adelaide University and Peter Cox of the University of Chester articulating a Foucauldian analysis of cycleways, as enabling the construction of cycling practice in particular ways, and concomitantly frustrating its articulation in other ways. Their paper illuminated two main strands of thinking across the workshop. First, echoing John’s analysis, to do with how the construction of cycling by particular legitimate discourses and interests as about mainly one thing (whether a leisure practice, a way of replacing car commuter journeys, a health practice, an environmental practice …) tends to render illegitimate alternative ways of understanding and doing cycling; we might almost say that in the act of creating cycling, cycling is destroyed. Second, we already know that the provision of off-road (aka segregated) cycling infrastructure is, however ‘good’ and/or useful, also in various ways problematic; and thinking across the workshop helped us to begin to see more precisely why – so that for as long as cycling provision is about separation from motorised modes, it remains importantly structured by impulses towards its displacement, constraint, control and punishment; so that cycling’s marginalisation within car-centric societies is (however inadvertently) perpetuated, and its radical potential thwarted. It’s also worth flagging up here that due to the large volume of abstract submissions, we had to narrow the focus of the workshop and therefore decided not to include quite a few exceptionally good-looking papers which took a social movement orientation to bicycle politics. We decided to focus on more general political and philosophical analyses of the barriers which prevent cycling from becoming more dominant, and on the illustration of these barriers through a series of empirical case studies. But we think there’s another very important workshop (or even workshops!) in there, and we would really like – and hope – to see such a workshop (or workshops) come about …. 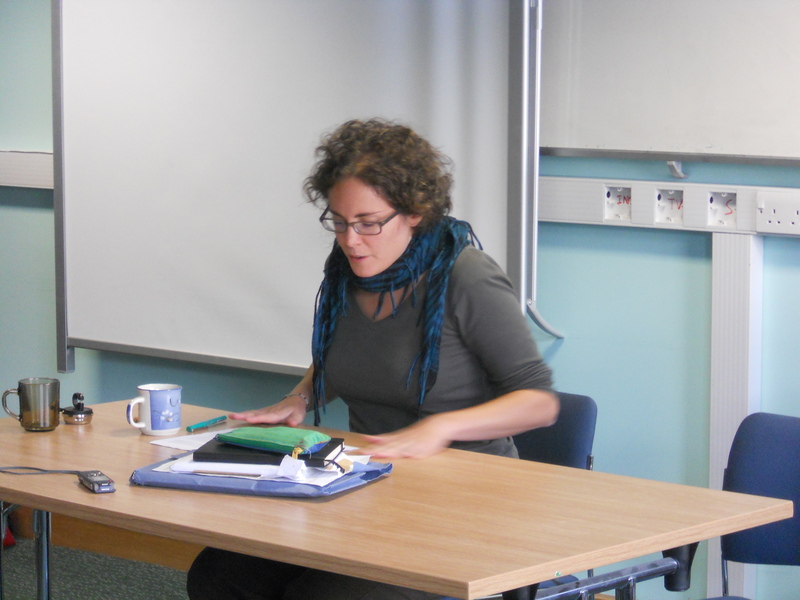 Next up, Esther Anaya, a bicycle consultant from Barcelona, provided a critical analysis of public bike hire schemes. Although Esther focused on Spain, her insights provide food-for-thought for public bike hire schemes everywhere; they also take us back to the insight that in the race to keep up with innovations taking place in other ‘global cities’ things are being done to cycling which might not necessarily be in the best interests of a radical (inclusive, democratic, progressive) politics of the bicycle. This is not to say we should rule out public bike schemes; to the contrary, the ways in which they are re-working not only city streets and people’s everyday practices, but also notions of appropriate ownership, are very interesting and potentially very important, and as such they demand further critical inquiry. Adopting a similar approach – of stepping back and thinking a bit more critically about developments which it is (quite understandably – we all want a good news story) too easy to feel happy and optimistic about – Robert Davis presented an empirical investigation of London’s recent so-called ‘cycling revolution’. Robert accepts that cycling really has increased in London, but he questions whether Transport for London’s (anyway none too ambitious) targets for further growth in cycling can actually be met, without radically exceeding those strategies (such as the public bike system and the cycling superhighways) which currently exist. Whilst we certainly do not wish to deny or denigrate Copenhagen’s achievements, by this point in the workshop it had become clearer to us (Aurora and Dave) what Copenhagen currently symbolises, and why it is held in such high – and relatively uncritical – regard: Copenhagen represents world best practice in actively promoting cycling within a society which remains structured by the car; Copenhagen is as good as cycling gets without de-centering the car. From the perspective of people pursuing a more radical bicycle politics, this might not be enough. We want a bicycle politics which produces gains far in excess of those made in Copenhagen, a bicycle politics in which car-centric societies do not accommodate the bicycle, but in which the car is replaced – and those societies are much more fundamentally transformed – by the bicycle. The workshop was about far more than these 12 presentations. It was about living out our principles in our everyday lives, about embodying those changes which we want to see come more widely about; so that – as examples – anyone who wanted free accommodation in our houses and friends’ houses was provided with it, and all food was vegan, provided by local caterers, and – along with teas and coffees – kindly and enthusiastically served by Rory and Stacey, two workshop participants. Many agreed that this created a particularly relaxed, homely and friendly atmosphere which energised and facilitated the presentations and discussions. The two days revolved around respectful, convivial and engaged discussion amongst everyone who took part. It was absolutely brilliant to see so many people, including a lot of young people who might not ordinarily be directly involved in higher education, looking very much at home at Lancaster University. As people who often wonder whether universities are perhaps part of the problem rather than part of the solution when it comes to working towards a socially just, environmentally sustainable planet, it was satisfying to see how the construction and elaboration of liberatory spaces, bringing together academic/activists of many different sorts for critical discussions, is nonetheless possible. So a massive thank you to everyone who participated – the people who presented, the people who chaired, the people who asked questions and engaged in discussion – everyone, for making the event work. Special thanks to Stacey and Rory, who for the two days kept smiling whilst they kept us all supplied with really great food and drink, to Nes from I Bike MCR, for so wonderfully facilitating the closing discussion before we all went our separate ways again, and to Griet for taking such great photos. After developing intimacy at an event such as Bicycle Politics, we find it hard to return to ‘everyday life’, but we hope that – like us – many other people returned to their everyday lives at least a little touched by their experiences in Lancaster. Finally, thanks to the Centre for Mobilities Research (CeMoRe), and especially John Urry and Pennie Drinkall, for hosting the event, to Colin Pooley and Sheila Constantine for helping to make it happen, and to both the Understanding Walking and Cycling project and the Cycle-Touring and Countryside Trust for contributing to its costs. And stay tuned for the next phase of work around bicycle politics!